RoundFlash Beauty Dish Flash Adapter | Beau Photo Supplies Inc. The Roundflash Dish changes a regular speedlight into a soft beauty dish, similar to a regular studio beauty dish combined with a sock diffuser. 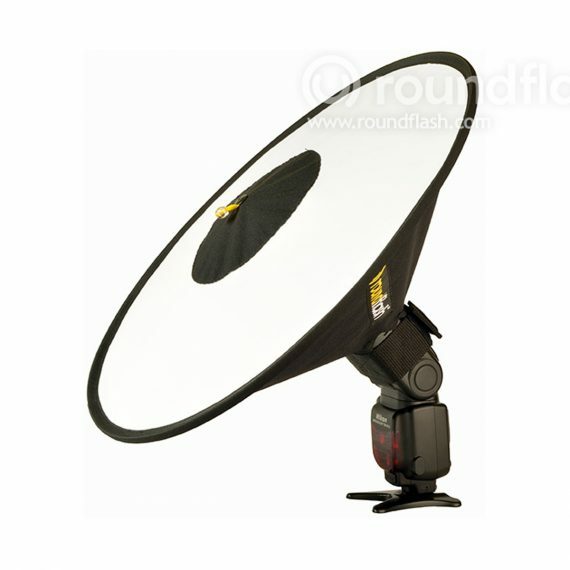 RoundFlash Dish is a perfect tool for headshots, portrait and still photography. Its compact construction with the mirror system interior allows you to light objects or people with directional, round, smooth flash light. The light from a speedlight reflects in the mirror system interior and becomes a very even ring of light. It only takes a few seconds to set-up and attach the RoundFlash Dish to a speedlight. It is attached directly to the flash with a built in adjustable Velcro system with no additional need for extra straps and clamps. Another advantage to the Roundflash Dish is that since there is nothing clamped to the front of the speedlight you can still gel your flash to produce creative portraits.